For years’ bloggers counted upon traditional recommendations for SEO: targeting one keyword, using it across the text, in the title, URL, and meta-description. WordPress users had great tools at hand – SEO plugins – that were their checklists for content creation. But today many bloggers may see that despite that fact they follow precisely the same tactics their posts don’t perform in Google searches as they expect. 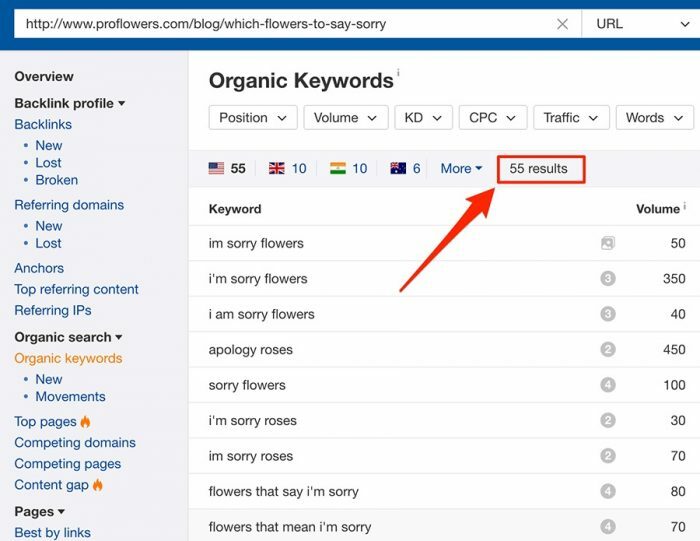 So how to make Google love your blog posts again? What’s wrong with SEO plugins for WordPress? It’s a provocative question. It’s nothing wrong in terms of how it performs. All popular WP plugins perform their functions excellently, showing you the number of keywords you set as your target ones, advising you about the keyword placement in the first paragraph of your copy, at the beginning of a title and in Meta description. But do all this stuff takes you to the first page of Google SERPs? Well, let’s revise all these SEO-plugins suggestions one by one. You should note that we are talking mostly about the “exact-match” keywords since SEO plugins are not made to “read” closely related keywords, LSI keywords, and other modern SEO stuff. 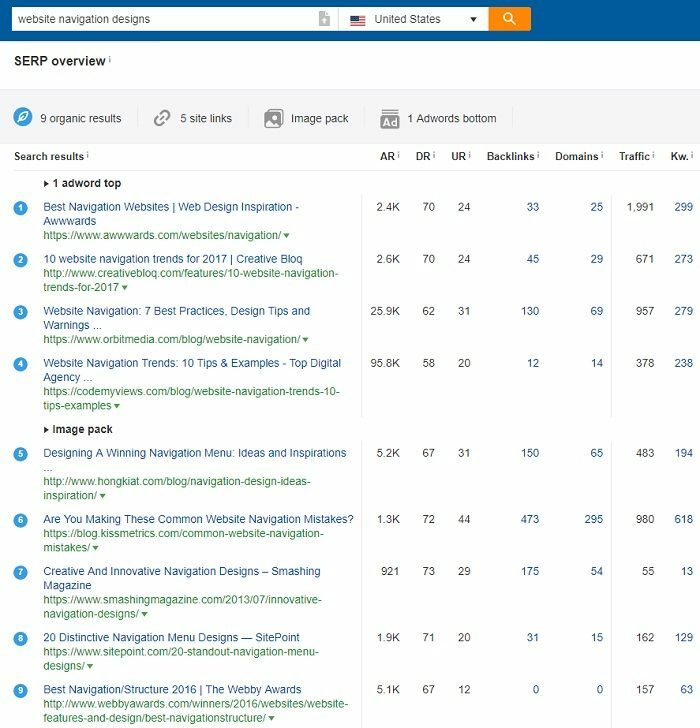 I just dropped an example keyword “website navigation designs” into Ahrefs tool and check out the top SERP for it. It is the first and the most striking thing here: among top 9 results, you won’t find any title that contains the exact-match keyword. Some results contain all these words – “website,” “navigation” and “designs” but in a different order. Some results miss one or another word. But all of them are on the first page of Google! The same is for the old practice of “trying and moving your keyword at the beginning of a title.” Seems pretty outdated and not supported by any logic. You can check out many keyword examples instead of mine, to see that Googlebot equally treats titles with the focus keyword at the beginning, in the middle or at the end of a title. In any case, no objective evidence of any impact of the keyword place in the title was found. Modern bloggers tend to create shorter URLs that not only avoid exact-match keywords inclusion but even don’t repeat the title itself as it was some time ago. From the results above, you can hardly tell that a certain URL is more optimized for search than others. Despite such fact, leaving a generic URL, a WordPress automatically creates for the post (like yourblogtitle.com/54867.html) is a big no-no. While Googlebot doesn’t care about the symbols in your URL – it easily crawls generic as well as descriptive URLs, – words-based URLs are just clearer for users. Search engine giant recommends using easy-to-read URL structure. Thus, you will improve the UX that increases trust in your website and its content. First, you have to know that Google doesn’t always display Meta descriptions in snippets. I just checked the source code for the first-page results for “website navigation designs”, and hardly 3 of them had their Meta descriptions in snippets. For others, Google displayed approximately 200 first words of the article. Article’s description should be aimed at readers in the first place! People decide whether to click on the link from SERPs by judging what they read in its snippet. So, make your descriptions as well as the first words of the text as more descriptive and compelling as it is possible. As I mentioned above, for most pages, displayed in Top-10 of SERP, Google shows the first 150-200 words of their copy. And there was no exact-match keyword in any one them. In some texts, we could spot semantically-close variations of the keyword. That means, despite the fact that SEO plugin will show you a red point next to “The focus keyword doesn’t appear in the first paragraph of the copy,” you still have chances to get higher in SERP. Because the exact-match keyword within first 100 words of your text has nothing to do with a perfect optimization. If you run through the results of the Top-10 in Google SERP, I bet you will hardly find articles with the keyword in more than one subheading. Moreover, you will hardly find the exact-match keyword included in any subheading across the copy! And if you try to add the keyword in many subheadings across the text – mostly it will look unnatural. Because Google aims at offering users’ relevant info, not machine-suggested. Relevancy of the content matters more than its keyword-rich structure. At first, you should understand what are ALT-tags anyway. Since Googlebot and all other bots are only good with the text info – I mean, they understand and crawl only words – ALT-tags are used to help crawlers to “understand” the contains of the image and display it in the search results. Descriptive ALT-tags help users to grasp the general idea about the image in case it can’t be loaded. But no exact-match keyword in ALT-tag will take your post to the Top-10 in SERP. I just did simple search across the texts in Top-10 results (you can do it too: use Ctrl+F combination + type in the target keyword). And what I got was zero exact-match keyword across each post. But all texts contained closely-related synonymic phrases like “website navigation,” “design of a website navigation,” “website navigation in designs” etc. It means that today you don’t have to include a certain amount of keywords into your post to rank high. You should see about making your posts as much relevant to your potential readers as possible. One of the best ideas is researching keywords within the main topic you wish to rank for. You can put your main keyword into the Keyword Explorer tool and go for a whole list of additional suggestions for this keyword. Or you can check out the keywords your competitors already rank for. If you check out the post from your competitors, you will see that each post also ranks for a great number of additional keywords you can also use in your own article. It will increase your chances to rank higher. SEO-plugins usually suggest making your copy over 300-words-long. Despite it’s a good suggestion in general, it doesn’t mean that longer text will automatically rank in Top-10. The longer copy is good for many reasons: it allows covering a topic in depth, using a great number of keywords, and making it more relevant to many readers. But don’t fall just for length without depth. It will do you and your readers no good. I hope you see now that you should not follow all these optimization suggestions blindly from your favorite SEO-plugin. So, what should you do instead? After you publish your post – build backlinks to it to get it higher and more visible in SERPs. SEO today is not what it was ten years ago, and exact-match keyword put in “strategic” places will not help you rank higher. So, try to put some effort into your content and create a compelling copy with a great number of various keywords included.